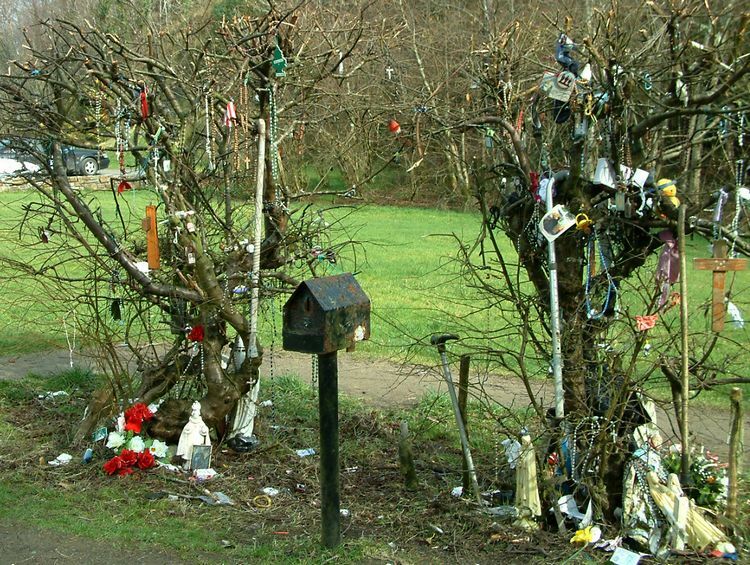 All over Donegal there are Holy Wells dedicated to different saints and many of whose waters are thought to be curative of various ailments. Around the Holy Well you will often see things like rosary beads, maybe children's toys, and so on. 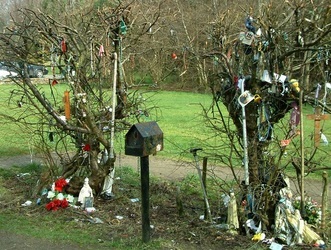 These would belong to the person for whom the prayers are being said at the Holy Well. 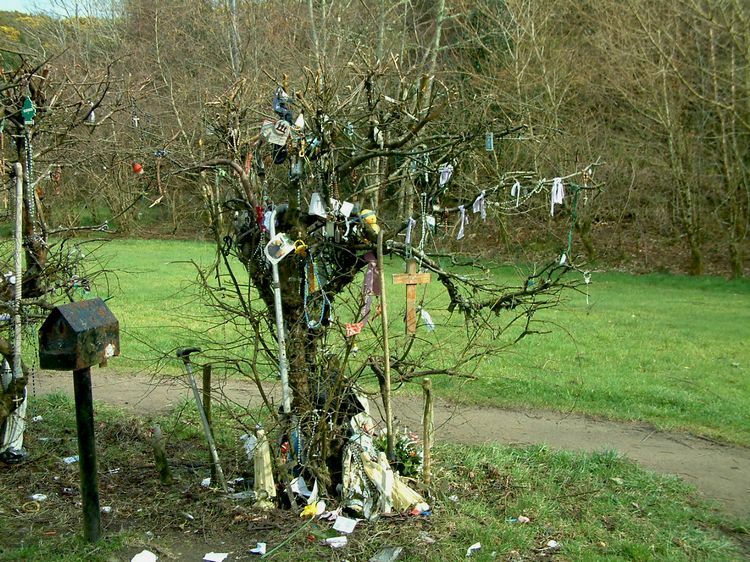 Often if there are bushes or trees nearby you will see bits of rag tied onto their branches and it is thought that as the rag rotted in the elements, the illness of the person being prayed for will vanish likewise. These Holy Wells are many centuries old and often beside them you will find a Mass Rock, and too in later years many of our (Catholic) churches are built beside or at least near them. Here are some of the Holy Wells in Donegal (we will add more as we find them). Scroll down to read more and view photographs (click on any of the photographs to enlarge). 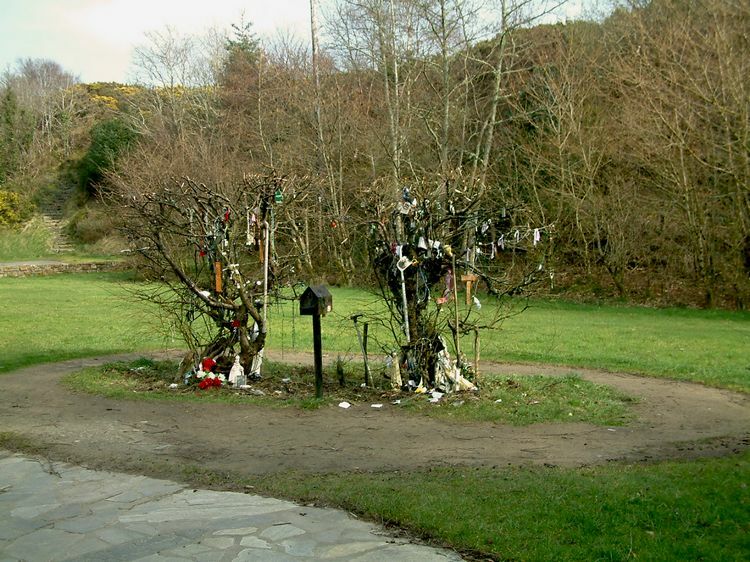 Near the village of Termon is Doon Well which is one of the most visited Holy Wells in County Donegal. Hundreds of thousands of pilgrims have visted this well which dates back hundreds of years. It is thought that a holy man, Lector O'Friel founded the well in the fifteenth century and it is also thought that he is buried in nearby Kilmacrennan in the old graveyard there. He was much venerated in the area because of his great ability to cure many ailments. Towards the end of his life the people became scared at the thought of losing him. But Fr. 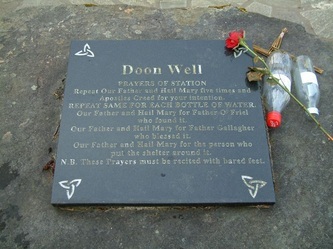 Friel told them not to worry as he would bless the well (Doon Well) and the waters of that well would when drank or applied, carry on his prayers for cures. There are no set dates to visit the well as there are with some others. People go there whenever they want and it is rare that one can visit it and not find people there. 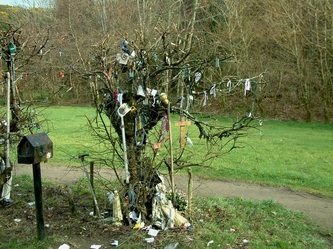 There is however a very large gathering there each New Years Eve with people coming from all over to pray at the well. The stone on top of the well reads: "Doon Well PRAYERS OF STATION. Repeat Our Father and Hail Mary five times and Apostles Creed for your intentions. Repeat same for each bottle of water. Our Father and Hail Mary for Father Friel who found it. Our FAther and Hail Mary for Father Gallagher who blessed it. Our Father and Hail Mary for the person who put the shelter around it. NB These prayers must be recited with bared feet." On the hill above the well there is a Mass Rock and on the other hill there is the Rock of Doon (Caraig an Duin) where the O'Donnell chieftans held their civil ceremony of inauguration for each new chieftan. This followed the religious ceremony which would have taken place in Kilmacrennan. 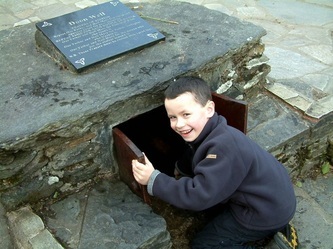 Just at the western edge of the village of Killybegs, up a little hill is St. Catherine's Well. The well is dedicated to St. Catherine of Alexandria (Egypt). 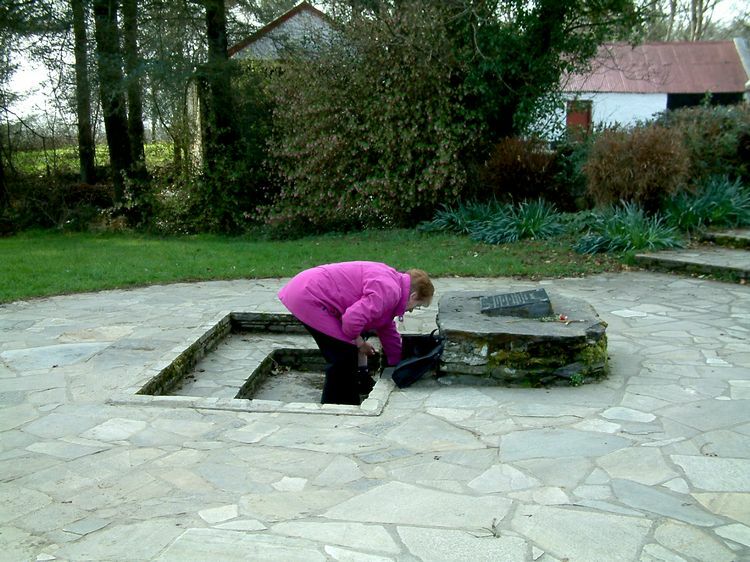 We have done some research into this and it seems that the well was dedicated to St. Catherine by three monks who were washed ashore at Killybegs after a bad storm. The name Killybegs in Irish is ‘Na Cealla Beaga’, meaning ’small cells’ which refers to the small cells built by monks who onced lived in the area. It is said that the monks prayed for their safety while at sea in a heavy storm and promised that they would build a well to St. Catherine wherever they landed should they be saved. And it is is Killybegs they landed in, hence the well and the fact that St. Catherine is the Patron Saint of Killybegs. Above the well is the ruins of the 14th century Kit's Castle and the ruins of the 15th century Franciscan Third Order Foundation and graveyard. The gates at the entrance to the path up to St. Catherine's Well were donated by the Sharkey family in honour of their late mother, Peggy. She is the mother of locally born and highly acclaimed artist Kevin Sharkey. This well is at the top of Mamore Gap on the Inishowen peninsula of Donegal. The views from the well are breathtaking. The stone at the well says St. Eigne was probably one of the Céile Dé who were probably Druids and who saw the coming of The Christ Consciousness and were preaching in Ireland and Scotland long before the first missionaries. There is reference to the Céile Dé in the Annals of the Four Masters in 806AD (The Annals of the Four Masters was written by four monks in Donegal Town and there is an obelisk in the town centre there commemorating them). The stone at the well reads: "St. Eigne's Well. The well of St. Eigne from whom the adjoining Desertegney takes it's name. He was probably one of the Céile Dé. There has been a pilgrimage to this well for centuries." Beside the well there is a Grotto to Our Lady. Nearby is Catsby Cave where Masses were said in secret during Penal Times. Outside the village of Doochary on the back road to Letterkenny is St. Sarah's Well. The water there is reputed to cure skin conditions and people can make a pilgramage there to either seek a cure for themselves or for a friend or family member. Should they seek the cure for someone other than themselves, they bring a piece of clothing or some other item belonging to the person for whom they are seeking a cure. The statue at the well is of Kraljica Mira (Our Lady, Queen of Peace) and on the base reads "Kraljica Mira 24.VI.1981 Medjugorje" The date, 24th of June 1981, refers to the date that six young people in the village of Medjugorje in the south west region of Bosnia and Herzegovi saw an apparition of Our Lady at about six pm on that day. The names of these young people are Ivan Dragicevic, Mirjana Dragicevic, Ivan Ivankovic, Ivanka Ivankovic, Vicka Ivankovic, and Milka Pavlovic. At the Well of the Angels there are in fact two wells. Above the wells is a Mass Rock where masses would have been celebrated in Penal Times. There is a story with these wells which is that when the Donegal Franciscan Friary in Donegal Town was destroyed, some of the Friars fled to the hills surrounding Donegal Town saying Mass in secret places. One such place was here at the Well of the Angels. The friar was called An Bráthair Ó Buí and he was saying Mass here to a group of people when the men on look out saw the approach of soldiers on horseback whose job it was to kill priests and Holy men caught saying Mass. The friar, thinking his time was up, knelt at the well to say his last prayers surrounded by the congregation. As he prayed a mist fell over the people and a flock of Angels in shining white surrounded them rendering them invisible to the soldiers on horseback who passed right by them without seeing them. The friar blessed the wells and as part of the prayers at the Mass Rock beside the wells pilgrims say a prayer for the soul of An Bráthair Ó Buí. Around the wells are seven stones which pilgrims touch to cure sores and other afflictions.